Tasty Race Of The Week: Loucks Games 3200! 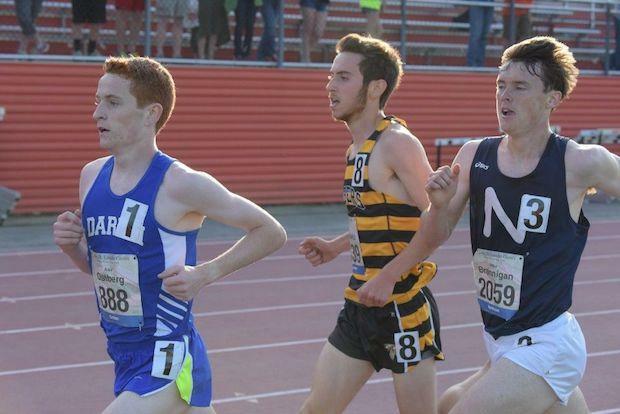 One of the deepest 3200 races ever found on the East Coast was seen on Friday from the Loucks Games in White Plains, New York when a grand total of ten guys ran under 9 minutes in the 3200 with all ten setting new personal best times. Two New Balance Nationals Outdoor champions from last June, Mikey Brannigan (2 mile champ) and Alex Ostberg (5K champ) led the field with Brannigan having the best kick of the two with a 59 second last 400 to win in a US #1 time of 8:42.92 followed by Ostberg in US #2 8:43.93. Five of the nation's top 6 times currently in the 3200 now come from the Loucks Games race which saw several state records go down in the process including New York by Brannigan, Connecticut by Ostberg, New Hampshire by Eli Moskowitz (3rd, 8:44.79), and Rhode Island by Jack Salisbury (8th, 8:56.55). Salisbury and his La Salle teammates nearly matched Mikey Brannigan and the Northport boys performance from a year ago when they put 3 guys under 9 minutes for 2 miles at New Balance Nationals with La Salle's Salisbury and Matthew Bouthillette (10th, 8:59.71) both going under the time for 3200, but teammate D.J. Principe (11th, 9:00.31) just missing sub 9 minutes to make it a trio. Watch the race above from a historically great and deep 3200 at the 2015 Loucks Games! WATCH MORE RACE VIDEOS FROM LOUCKS GAMES!